A few job search tips and tools that you just might not have thought of. This is a guest post by David Corman. If you’d also like to guest post here on JobMob, follow these guest post guidelines. Keeping tabs on what your friends and contacts are doing is a fundamental step in your job search. Although LinkedIn is great for leveraging 2nd and 3rd degree connections, you’d be surprised how helpful your 1st degree friends and acquaintances can be towards building the influence you seek. Tools such as Gist, for example, sync all of your online networks with your e-mail, Google Calendar and more to build a dashboard of all the people and businesses you are associated with. You’d be amazed at the quantity and quality of the companies you are connected to just from your friends and address book! Creating an overview of these relationships can be an instrumental step in planning your job search and networking strategies. With this information, you are sure you discover contacts that might have just the leverage you need to point you towards a job opening. Whether they are interviewers, colleagues you are networking with, or just friends, it helps to know more information about these people and what they are up to. Rapportive, an app for Gmail (eventually to roll out for other e-mail clients as well), is a highly useful tool that imports basic information for all of your e-mail contacts including current and previous job titles and links to their Social Media profiles. Rapportive simply helps you get to know the people you are in touch with better. You’d be surprised how many people you interact with who you’d be interested in knowing more about and deepening your connection with. This tool automatically imports this information right into your inbox, building your network easier than ever. With deeper connections, your relationships will surely prove more fruitful both in your immediate job search and down the line as well. Keeping tabs on what is going on in your field of work is another way you can rise above the rest. Just knowing the recent trends and news in your industry is important in presenting yourself as a knowledgeable and well-read potential employee. More outside the box, companies that recently got funding, won new contracts, were bought out by local firms, etc. often immediately go into hiring mode. Even if such a company does not have an available position at the moment, you’ve still made a new contact. The fact that you were eager and interested in a particular firm could certainly help open doors in the future. In the local Israeli market, I highly recommend reading business news sites such as Globes as well as regular news sites such as Ynet’s English News (check the headlines at the bottom of the homepage) that often carry stories about interesting trends or companies in various sectors. LinkedIn also recently launched a feature that enables you to follow companies of your choice and subscribe via email to find out about the latest hires, company news, and more. The third way to become a job hunting rock star is to attend events in your field(s) of interest. Whether it is a local meetup group or a nationwide conference, getting out there in the real world is a great way to meet people who share the same experience and expertise as you have (not to mention learning a thing or two). In my personal career, I have met people at events large and small who would later become my future boss, business partners, clients, colleagues, and friends. You might also consider organizing your own event such as a “meetup”, “tweetup” or volunteer program to make connections with others and present yourself as a leader in your field. There is no magic formula when searching for work. I can, however, attest that these tips have helped me immensely in building my network over the years and landing jobs that sometimes were never publicized at all. Even if you are not actively looking for a new job, when you grow your connections and stay on top of what is happening around you, you are building towards your future success. David Corman is the Internet Marketing Manager at J-Town Productions Ltd., a Jerusalem based Web Consultancy helping companies and non profit organizations succeed on the Internet. He is an avid reader of JobMob and loves helping people acclimate to life in Israel, especially in their job search. Follow David on Twitter @davidcorman. This article is part of the 4th Annual JobMob Guest Blogging Contest, which was made possible thanks in large part to our Gold Sponsor, Jason Alba of JibberJobber. If you want David Corman to win, share this article with your friends. If you like this article, you'll also enjoy 37 Ideas to Grow Your Job Search Network Right Now. Subscribe to JobMob via RSS or email and follow me on Twitter for more ideas on how to grow your job search network. Great article-Israel is an absolutely amazing place to be & the insights in this article help making living here more of a reality. Keep up the good work! Thanks Jeff and Simcha for your comments. I appreciate it! Help me win a blog contest! 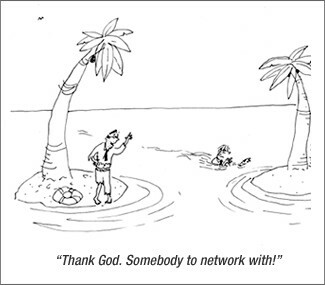 3 Out of the Box Ways to Grow Your Network & Land Your Next Job http://bit.ly/bPl4pJ Pls read and RT! This post generated lots of great comments and raised a lot of interesting points.